Plant and animal species are considered endangered if they occur in the wild in such low numbers that, without protection, they risk the possibility of becoming extinct. According to 2003 China state media reports, at least 15 percent to 20 percent of the country’s native species were endangered. According to the International Union for the Conservation of Nature’s Red List, 279 endangered species exist in China. These endangered Chinese plants and animals include species such as the giant panda, the golden monkey, the gingko biloba tree, the moon bear and the Chinese alligator. Industrialization, economic development and the pressure associated with a growing human population have caused widespread destruction of natural habitats in China. People systematically clear large areas of wild forest for agricultural use and to produce timber and wood for fuel. This habitat loss causes affected species' populations to diminsh. At some point, certain species may become threatened or endangered. 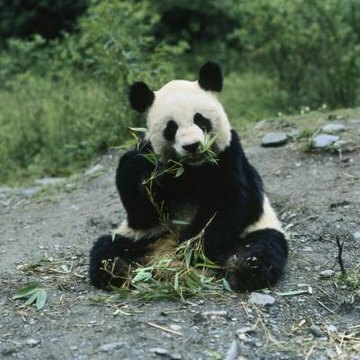 The giant panda, for example, lost half of the forests constituting its natural habitat between 1974 and 1989. The golden monkey, found exclusively in China, has suffered significant population decline due to deforestation. Much remaining habitat is degraded by significant water and air pollution, threatening rare birds, reptiles and marine life such as the red-crowned crane, the Chinese alligator and the Chinese river dolphin. Many newly wealthy Chinese citizens want exotic meals in fancy restaurants and are willing to pay large sums to consume rare and endangered animals such as leopards or king cobras for dinner. A 1999 survey by the China Wildlife Conservation Association revealed 25 percent of dishes consumed by the Chinese were made up of some form of protected wildlife. Many endangered species, including flying squirrels, monitor lizards and pangolins, are ingredients in popular soups. Many are considered rare delicacies by the Chinese elite, and restaurants turn a hefty profit by preparing them. Raids on Chinese restaurants routinely seize reptiles and rare birds -- animals destined for the dining table despite being legally protected as endangered species. The use of native plants and animal parts in traditional medicine is a centuries-old cultural practice. Snake venom and parts, for example, are alleged to restore health and are even believed to boost sexual prowess. Rhino horn allegedly serves in traditional Chinese medicine to treat a number of physical conditions. The Javan rhinoceros, critically endangered due to being hunted primarily for its horn, may be extinct in China. Bile from the endangered Chinese bear's gall bladder is also in high demand for its supposed medicinal qualities. International curiosity about traditional Chinese health remedies has led to the manufacture of a number of patented Chinese medical products, many of which contain difficult-to-detect trace ingredients derived from endangered plants and animals. In 1981, China signed the Convention on International Trade in Endangered Species, an international treaty that prohibits commercial trade of endangered plants and animals. In the 2013 meeting of the convention’s signatory nations, China nominated 40 different species for greater protection under the treaty. China’s national Wildlife Protection Law provides stiff criminal penalties and heavy fines for hunting or trading in endangered wildlife. The country also has attempted to alleviate the pressures of habitat destruction by creating nature reserves. As of 2000, 1,276 wildlife reserves covered 8.7 percent of Chinese land. Is the Argentine Boa Constrictor Endangered?